The Fish River Canyon is the second largest canyon in the world and the second most visited tourist attraction in Namibia. It is a spectacular sight and slightly off the beaten track but a definite must-see. The Fish River Canyon is situated in southern Namibia and is the second largest canyon in the world (after the USA's Grand Canyon in Arizona). It is the second most visited tourist attraction in Namibia and one of the most remarkable natural beauties in the country. 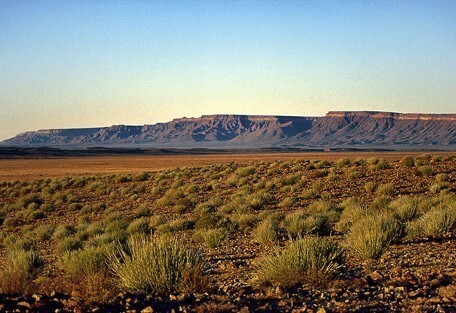 It drops vertically by 550m out of a flat arid plateau and at some points it is 27km wide! 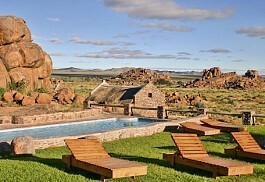 It is a magnificent sight, however a little off the beaten track a must-see in Namibia. The Fish River Canyon was formed by the erosion of water of the Fish River, remnants of which appear as distant emerald pools on the floor of the canyon. One of Southern Africa's most popular hiking trails are located here. The Fish River Canyon trail covers a distance of 86km in the base of the canyon, over 5 days and is definitely for the more adventurous guest and only recommended for experienced hikers as there are no facilities provided. Today the canyon measures 160km long up to 27km wide and almost 550m at its deepest. It is located in the far south of Namibia and can be incorporated beautifully into a southern Namibia circle, including Sossusvlei and the Skeleton Coast. Self-drive tourists, hikers, photographers and nature lovers world-wide are attracted to this long, thin, meandering river. The river flows intermittently, usually flooding in late summer; the rest of the year it becomes a chain of long narrow pools. The environment of this spectacular scenery embraces a number of habitats bringing together several species of mammals, an abundance of reptiles, insects and fish that live in natural pools and the Fish River itself. The focus here is not on wildlife, but more on the indescribable landscape, the photography, and getting on your feet. Cañon Village offers magnificent views of the Gondwana Cañon Park, located only a short drive from the famous Fish River Canyon. Accommodation consists of comfortable Cape-Dutch style cottages each offering en-suite facilities and thatch roofs. Cañon Lodge offers a unique and private desert location in Gondwana Cañon Park adjacent to the Fish River Canyon with beautiful sunsets and spectacular landscapes. Cañon Lodge has a traditional country-feel in an old farmhouse-setting offering fresh farm produce. 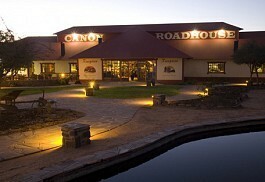 Cañon Roadhouse is situated on the doorstep of the magnificent Fish River Canyon National Park in the privately owned Gondwana Canyon Park; the second largest canyon on earth. The lodge is renowned for their delicious meals and superb service. The landscape here is barren, dusty and rock strewn, however the hills and gorges are enticing. The area is too hot to visit during the summer months and the recommended time to visit is between April and September, this is also the only time when visitors can walk the Trail. Ais-Ais Hot Springs falls within The Fish River Canyon conservation area and the hot springs are a public facility. Wildlife in the area is limited however springbok and steenbok are occasionally seen on the plains at Hobas. Some kudu inhabit the densely vegetated lower reaches of the canyon. The riverine bush of the canyon attracts an interesting variety of colourful birds and raptors such as rock kestrals and lanner falcons ride the thermals. A variety of activities is available in the area and includes guided excursions to the Fish River Canyon; scenic flights, hiking trails, horse trails; scenic drives as well as game viewing. Like in most parts of Namibia, summers are very hot, while winter nights tend to get very cold. There is not much rain throughout the year, and in fact, this country is prone to droughts. 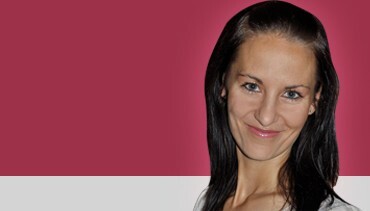 In 2012, Namibia experienced one of the driest years in a long time. Summer is the time for rain, and the relief the rains bring to the hot, arid coutry is a relief. The hottest months of the year, December to Febraury, bring the rains that nourish the earth. Temperatures stay in the mid-30s (degrees Celsius) during the day. The dry winter months occur between May and October when no rain falls whatsoever. The day time temperatures remain comfortable in the mid-20s, but night time temperatures can drop to freezing. Cañon Roadhouse is situated on the doorstep of the magnificent Fish River Canyon National Park in the privately owned Gondwana Canyon Park. It offers an affordable alternative for guests wanting to explore this beautiful area. Cañon Village is situated at the foot of a rocky mountain in the private Gondwana Cañon Park. 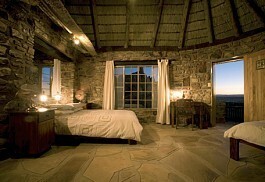 It offers the ideal base for guests wanting to explore the area as well as the famous Fish River Canyon. Guests wanting to drive themselves to teh Fish River Canyon from Windhoek (where they will most like fly into the country) can expect an approximate 6 hour journey and will easily accomplish this drive in one day. Sun Safaris will arrange flights into Windhoek, from where guests wanting to visit the Canyon will connect with a short flight to an airstrip in or near the Fish River Canyon. This will cancel out self-driving and guests will be guided and taken care of by lodge staff throughout their stay. A representative from the lodge will meet guests at the airstrip and take them on the scenic drive to their accommodation.